Hair rinses are literally hair treats! Home made herbal hair rinses are packed with plant nutrients, minerals, and antioxidants that help restore moisture and shine to your hair, reduce hair fall, relieve your scalp of dryness, itchiness, or excess oil production, as well as promote hair growth. The biggest advantage of using a hair rinse instead of a shop bought conditioner is that it is free from synthetic chemicals or preservatives, which are present in most of the conditioners – whether organic, herbal or natural. Whereas herbal hair rinses are 100% natural and so pure that you can practically drink it. Plus, hair rinses are very simple to make and many of the ingredients can be found in your kitchen or your garden. Here are some simple hair rinse recipes for you to create at home – to boost up the shine in your hair and make it look healthy and bouncy. Reetha – shikakai rinse is my favorite. It is cleansing, nourishing, pH balancing, as well as conditioning. Basically, it works as a hair tonic, which will make your hair healthy, restore natural luster, and add body to your limp hair. Reetha and shikakai contains high levels of saponins – natural cleansing agents – so you can also use this rinse in place of your regular shampoo or as a post-exercise rinse. Amla provides nourishment to the hair roots, and promote stronger, healthier new growth. This rinse is nourishing as well as refreshing, and will add life to your dull locks. Fenugreek is rich in natural proteins that provides nourishment to your hair, and help keep your hair shiny and silky. It is also an excellent remedy for hair thinning, shedding, dandruff, and scalp problems. 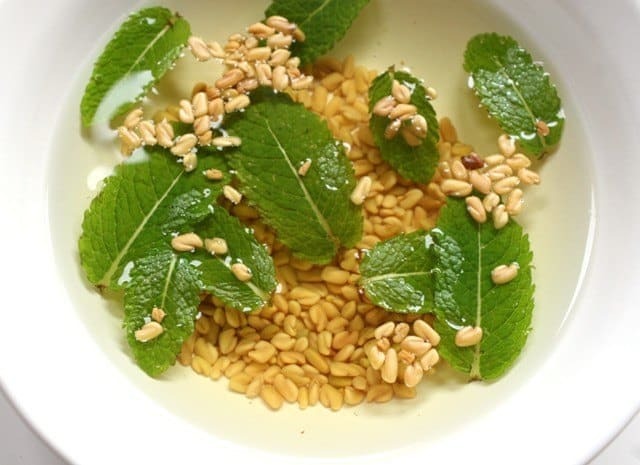 Mint is refreshing and energizing and will give your scalp a tingly feeling. While lemon juice removes oil and soap residue and gets hair really clean. 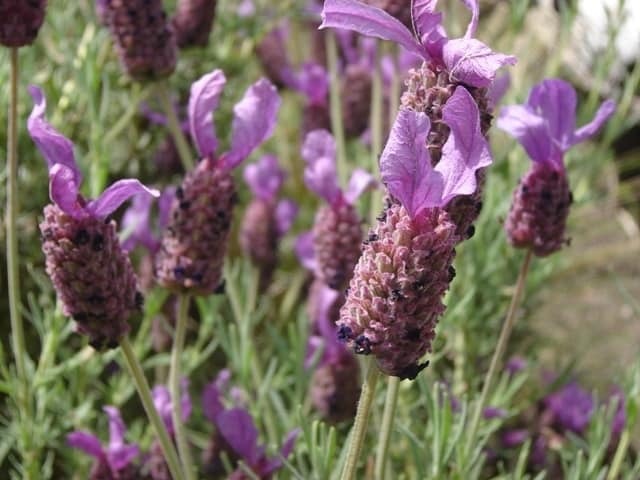 Lavender has a balancing effect on the production of sebum which makes it useful for people with oily hair. 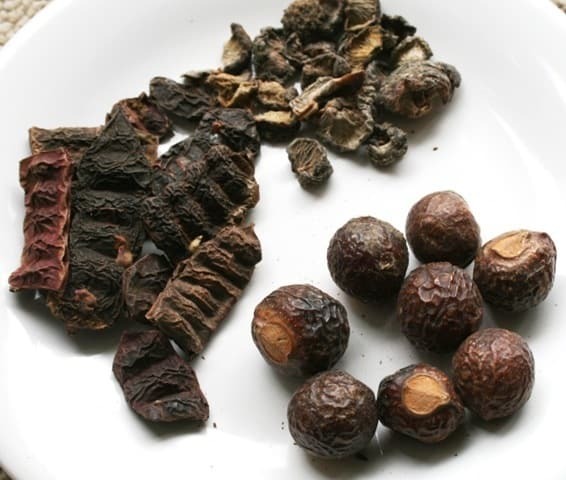 It is also extremely healing and valuable in treatment of inflammatory scalp conditions. While witch hazel leaves or bark are astringent and help deep clean oily hair. Due to its astringent and tonic properties, lemon makes a very good rinse for those with oily hair. Plus, it also helps with dandruff, soothes scalp irritation, and revitalizes both scalp and hair. 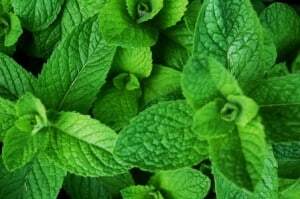 Mint increases local blood flow to the scalp and cools and refreshes the hair and scalp. Note: Regular use of lemon rinse will lighten your hair. 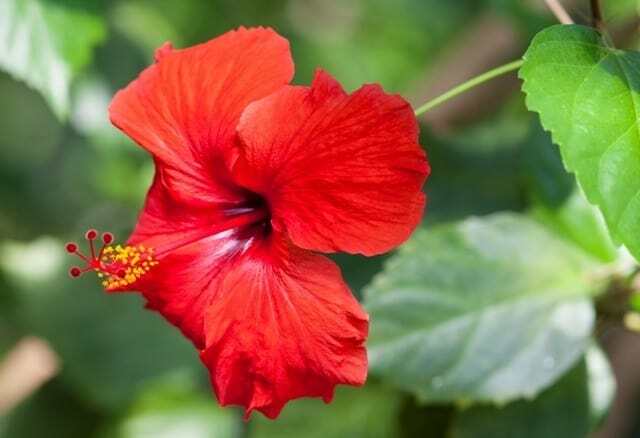 Hibiscus, or Gudhal or Jaswandh, is an excellent all-natural hair conditioner. The flowers and leaves contain mucilage – a slippery, gluey substance – that hydrates hair and provides excellent slip to make detangling easier. 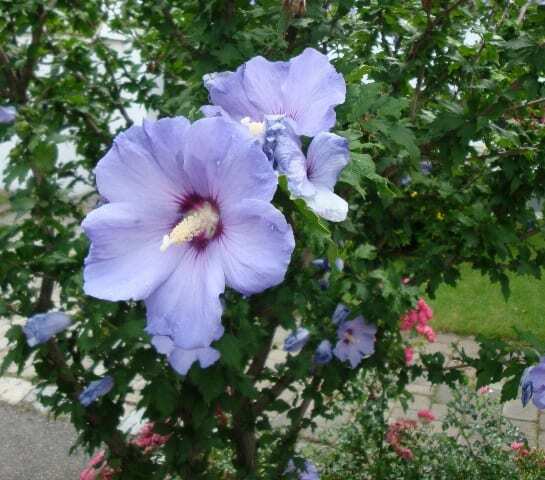 Hibiscus also help soothe scalp irritation, lessen grey hair, and reduce hair loss. Licorice, too, is very moisturizing to your scalp and hair. It contains antioxidant and anti-inflammatory properties that help stimulates hair follicles and soothe dry irritated scalp. Marshmallow root has high mucilage content which adds slip for easy detangling as well as conditioning the hair. High in plant proteins, this white root nourishes the scalp and promotes healthy hair growth and shine. It also soothes the scalp and aid in healthy scalp maintenance. How to Make Hair Rinse? 1. Soak the herbs – dried flower/leaves – in water for about 7 to 8 hours or overnight – to release their goodness. But if you are in a hurry or if you are using fresh flowers and leaves then you need not soak and proceed straight to making, as directed below. Why pre-soak? Pre-Soaking herbs, especially the seeds and pods, helps release more of their properties into the water, and consequently make stronger rinse. 2. Combine the herbs with water in a stainless-steel pan. Bring to a boil, then reduce the flame and let it simmer for 2 to 3 minutes. Turn off the heat, cover the pot and leave it to ‘steep’ until it cools. Strain out the herbs and use. 3. If you live in hard water areas, add 1 to 2 teaspoon of lemon juice to the cool down mixture. This will get rid of the cal or any product residues from your hair as well add shine and luster to it. 4. If you have dry or damaged hair stir in 1 to 2 teaspoons of honey to the rinse. This will enhance the conditioning effect of the rinse. 5. Feel free to experiment with other herbs and essential oils. That is when you will find a recipe that works best for your hair. You can also use rice water as a hair rinse. Here’s how to use. Apply the mixture on freshly washed hair. Pour the rinse over hair and massage the scalp gently using a circular motion. If you can, catch the drippings in the bowl and keep pouring them through your hair until they are all used. Soak hair in the mixture for at least five minutes. Rinse with clean water and let your hair dry naturally. Use instead of shampoo: If you wash your every day or every other day then use one of the hair rinse recipes instead of shampoo. Herbal hair rinse is a gentler way to clean your hair as well as nourish them. And it’s minus the detergents and preservatives. Once you have identified which rinse works best for your hair type it is pragmatic to make large batches as it saves time. Without preservatives, the mixture will stay good in the refrigerator for up to a week. After that it will have molds and bacteria growing in it – which may not be visible, but they are still there. If you are making large qualities then the best way to store the rinse, without any artificial preservatives, is to freeze it. 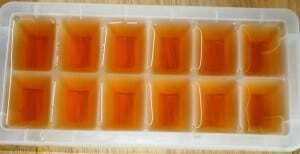 I fill about 2 to 3 ice-cube tray, which lasts me for good 2 months. Use 2 to 4 cubes depending on the length of your hair. 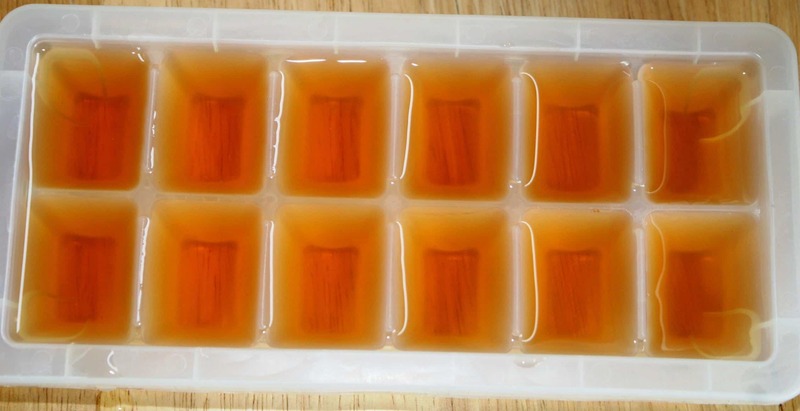 You can unfreeze the rinse cubes by leaving them outside for couple of hours. When in hurry I add hot water – about quarter cup – to unfreeze them. I prefer not to use microwave as it can destroy the goodness of the rinse. The regular use of these wonderful therapeutic herbal rinses will make your hair silky soft, lustrous, and gorgeous looking. Do you use herbal hair rinses? Please share your experience in the comment box below..
– Using a covered pot, decoct your herbs for 10-15 minutes. I generally use 1/4 cup of herbs per cup of water. – Strain out the herbs and combine your herbal infusion, essential oils, and baking soda together in a glass jar. You want the baking soda to be completely dissolved and well mixed. – Allow to cool to body temperature. – Pour over dry hair or soak hair in the mixture for at least 5 minutes. Massage the scalp gently using a circular motion. – Rinse out with clean running water. Previous Post How to Wash Your Hair – 7 Tips for Great Hair Next Post How to Make Sulphate Free Shampoo at Home? SO glad I found this! But I had a bit of a disaster. 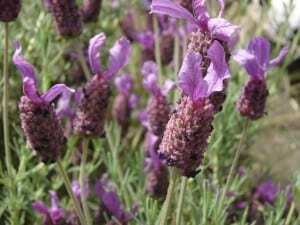 I have fragrance allergies so am always looking for DIY ways to save myself. I have dry flaky scalp and dry hair curly too. I steeped water and amla, Reetha, shikakai in 2:1:1 ratio and though my scalp was flake free and non itchy but my hair was like hay 🙁 What did I do wrong? I like my curls but this was not-fun bohemian. Hi Smita, you put too much amla. You can also add some fenugreek seeds or marshmallow root for extra conditioning. Thanks! Will tinker. Also I have soaked methi seeds in water and want to use as a leave-in but I applied a teeny weeny bit and it stinks 🙂 Ideas to mask the smell? Also, somehow I did not get an auto email when you responded, I just happened to back to the site and realized you responded. I want to be able to make this in large batches without freezing, to reduce was times. Are there any natural or other preservatives we can add to increase life of a large batch? Lemon or any other? Hello, just a quick question. When you finally rinse with clean water again after the herbal rinse, won’t that undo the rinse? Or maybe you mean rinse again with the filter jug? I’m afraid that if I rinse my hair again with the shower water which is very hard, I won’t see the benefits of the herbal rinse and I will still have hard water residue in my hair. That’s a very good question. Rinsing with water won’t undo the rinse, because your hair and scalp absorbs it. I too have hard water and it works like a charm. I only recently found this article – not sure if you are still replying to questions… I have blonde hair. Will the hibiscus stain my hair? I am making the ‘dry hair’ rinse now and seeing how red it is, is making me worried it will turn my hair orange! It will not stain your hair. For future you can use chamomile flower instead of hibiscus, it’s great for blond hair. First , if you add honey to the herbal rinse , doesn’t it make it sticky? And, I have dry hair but my scalp is dry-normal, not oily. I have fine, wavy, frizzy hair. Can you suggest a shampoo can clean my scalp well and keeps flakes at bay and not make it itchy? I cannot seem to find a good one. I used an aloe-coconut-honey hair mask last time ,it was time taking and a lot of work. But it did largely reduce the flakes and the itchiness. Hi, how to make hair rinse with reetha and shikakai powder? I love your page!!! 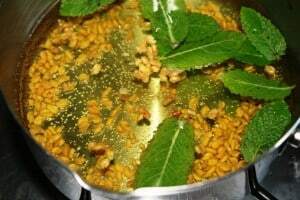 I will be making herbal rinses to take the place of conditioners. My question is, do I have to rinse it out or can I use it as a leave in? Hello, I prefer to rinse out, some people like to leave it in. Try both and see what your hair likes. Hi Nerti, witch hazel is great for oily hair. You can use it as hair rinse or hair spray. I enjoy reading your blog. I wanted to know whether you can you apply an oil treatment to your hair before washing your hair with these hair rinse recipes. Hello Aananthi, yes you can apply oil before using the hair rinse. But it won’t take the oil out, you will have to wash it with an egg shampoo or a store bought shampoo. Do you think you could use water canning for these recipes so that you could store them in a pantry? That is unlikely to help Kelly. Water bath canning is a safe way to preserve high acid foods like tomatoes or vinegar pickles. Low acid foods require pressure canning. Your herbal rinses are not acid enough for hot water bath canning. I use soap on my head, is it good to use soap for washing the hair? It doesn’t work for my hair, but I know some people use it with success. And they then follow up with hair rinse. Thank you very much for your fantastic tips and recipes on how to take a good care of the hair. Your website has been a huge inspiration to me! From all of the hair rinses I’ve tried out so far I find tomato juice hair rinse to be one of the BEST. My mom’s liked it very much, too. I take two or three homegrown ( in our glasshouse) tomatoes, blend them to juice and use a strainer to separate the juice from the seeds and skin. Having kept it 4-5 minutes on the hair and rinsed it out, the hair becomes exceptionally silky and soft to touch and shiny to look at, as if I’ve done the hair oiling. Besides, it truly diminishes some greenish tint on the hair, which usually remains after the use of horsetail oil or hair tea and even some hair dye. Plus, tomato juice rinse gives a beautiful, warm yellowish brownish hue to my dark blond hair. My mom’s fair hair becomes slightly brownish pink, which disappears upon drying. Thanks for your kind words Rasa. I am so happy to know you find my site inspiring. I prepared a henna gloss using a bit of henna, amla and shikakai with oil & water. (it came to about 3 TBSP total)..then added it to about a cup of conditioner. I also prepared a hibiscus-marshmallow root-horsetail-nettle-green tea mix with a few drops of Rosemary and peppermint essential oils. Can I use both in the same wash? If so, what order should I do? Use henna gloss, shampoo, then herbal rinse. Can i use HibiscuS tea instead of dried or fresh? I have driy hair thats damaged from bleach and is naturally med thickness and curly. Yes you can give it a try. And if that feels dry maybe add marshmallow or rosehip to it. You added too much marshmallow. I have white hair, which I want to keep, and have somewhat hard water. My hair has been getting a greenish tinge to it, which I assume is from the chlorine in the water. Do you have any ideas of the proper herbs, etc. I should be using for either washing or rinsing hair? Hi, I haven’t tried this, but read that tomato juice can help remove greenish tinge. You can also try apple juice or white wine vinegar. Hi, add methi to the shampoo and use less reetha. I just wanted to say that I love these recipes , and I am very thankful that you shared them with us. While my hair is still going through the detox, it has not felt this good in years. I live in an area with fairly hard water. If I rinse my marshmallow root rinse wih water should I add acv to the water? Yes you could, try both ways and see what you like. You can use 1st one as shampoo and marshmallow rinse as conditioner. I would suggest you wash and condition every alternate day as it better for your hair and scalp. I am just starting to use natural shampoos and conditioners and so far the ones I have found have left my hair feeling rough and though it doesn’t look dry it feels dry. I have naturally curly hair and when I wear it natural which is most of the time I have dry, frizzy, easily tangle hair which is why I like to condition it every day; however at the times when I occasionally straighten my hair it doesn’t have that frizz or dryness to it and feels healthy which is why I still like to add the shampoo to my every day routine. So to keep to my daily routine of shampooing and conditioning can I use the 1st one as a regular shampoo and any of the others as a conditioner rinse daily. Or would the 1st one act like the Wen hair product that washed and conditioned which is what I was using but the FDA issued a safety alert on it last month and that is why I stopped using it. Can you use organic powders instead of seed and leaves? And do you need to boil the mixture? If you areceived using the powders instead of the seeds and leaves, will it habe the same benifit as the whole leaves and seeds? And do u need to boil with using the powders? Hi dear. Will it be OK if I do not wash off the rinse from hair and leave it to dry. Can it cause any harm? Hi Pragya, It shouldn’t harm. But try both ways – leave-in and wash out. See what works best for your hair. how much of the rinse do you use each time, the whole batch? No, just use enough to soak your hair and save the remaining for later use. instead of lemon we can use orange and bergamot rinds to get rid of dry scalp.i have white hair i want to darken my hair and my dry scalp.please suggest me solution . use amla that will help darken your hair. For dry scalp try licorice. instead of lemon we can use orange,bergamot they also from citrus family. so they have power to avoid dry scalp because u mentioned that frequent use of lemon makes hair lighten. I’m not sure I did this correctly..after boiling the mixture and straining, do you use the water part as the rinse or are you using the residue left behind? I color my hair since it’s mostly grey. The women in my family go grey very young. Would I still be able to color my hair and use these recipes? I’m only 35 and don’t want to go around with grey hair. I was thinking can you use spearmint instead of mint in the hair rinse? Do you know if it will give the same results as using mint? I have been using recently hibiscus flowers and tomato hair rinse and I’ve started to get dandruff. I was just wondering if the spearmint will help prevent it. I have never gotten dandruff before till have started using this new rinse. Before I was using a combination of hibiscus flowers, lemon rinds, and a bit of honey, since I have damaged hair. The rinse made my ends of my hair stiff and dry. Which made me change in ingredients in my hair rinse. Yvonne, looks like your hair and scalp needs moisturising. Hibiscus and tomato combination is very acidic and therefore drying your scalp and causing dandruff. This looks interesting.. You have mentioned that these rinse should be used instead of shampoo.. But will it remove extra oil from our hair and scalp? I apply coconut oil before washing my hair.. I have very dry hair so skipping oil can be risk I think. Can I use it after shampoo? Hello Tejashri, these are conditioning hair rinses, use after shampoo – except the first one, which you can use as a shampoo, but it won’t remove oil from your hair. I looked at the shikakai pods and dried pieces of amla on Amazon, as you suggested above in your recipe, but wasn’t able to find any. I already have them in powdered form and would now like to experiment with the whole ones, any suggestions from where I could order them? Anita, where do you live? I have lighter hair colour ,can i use fenugreek n mint rinse as it contains lemon juice ? N how can i darken my hair colour naturally (to jet black).? Is it a must to oil hair before hair wash .i mean can i skip oiling hair n just wash with the herbal rinses.? N can these rinses alond remove oil..? If you want to darken your hair use reetha-shikakai rinse. I oil my hair before hairwash ,in tat case can i use these herbal rinses alone instead the shampoo ? Hello Swetha, Yes you can use. I’ve been thinking of rinsing my hair with citric acid as a natural conditioner and also because I have hard water. I’ve been rinsing my hair with lemon juice (dliuted with water) and it has made my hair so soft and manageable. Do you think that due to the ph of the citric acid that it my damage my hair? Hello Naz, Lemon contains high amount of citric acid, so why should you go for commercially derived citric acid. You can alternate between orange and lemon juice. Also try shikakai and honey rinse, works great in hard water. Using citric acid seems easier because squeezing lemons every time I wash my hair is quite arduous. I also found that buying citric acid is cheaper than buying lemons because you can buy 200 g of citric acid for about £2 online and there is a lot more lemon juice in a teaspoon of citric acid so you would need less citric acid for each wash. Thanks for the advice and I will try the shikakai and honey rinse. Since hibiscus gives red hues.. and lemon lightens hair.. would it defeat the purpose if I used them in the same hair rinse? Or would it give me both benefits? Kaia, you can use them together. And do share your experience. Love, love, love these recipes! I shall have to try them at once 🙂 I’m especially intrigued by the hibiscus rinse since I henna my hair with just pure henna, so I won’t mind the red tint. I’m thinking calendula flowers could also make a nice rinse, they’re also supposed to work wonders for dry hair. Do you know if making a rinse with citrus peels will dry out hair as citrus juice does? Or is it just the oils that come into the rinse by infusion? Hi Eva, glad you liked the hair rinse recipes. My mom too uses reetha-shikakai shampooand she has inspired me to go natural. Calendula is excellent for dry hair, plus very soothing for the scalp. You can also add some citrus peels to it, use orange, mandarine, or grapefruit, but no lime or lemon as they will dry out hair. Also try shikakai powder and honey rinse. Let me know if you have any more question..
Hello. Thank you for taking the time to post all of this wonderful information. How much water would I use for these rinses? Also, after I soak, am I cooking with the same water? Hi Michele, I have written in each recipe, 1-2cups. Yes you cook in the same water. Thank you. One more quick question when you have a moment. Would white hibiscus flowers work so that I can avoid the red hue. I am not sure, but I don’t see any harm in trying once.